These delicious, sweet, and chewy sweet potato balls are a staple Thailand walking-round snack that can be purchase from street vendors everywhere. 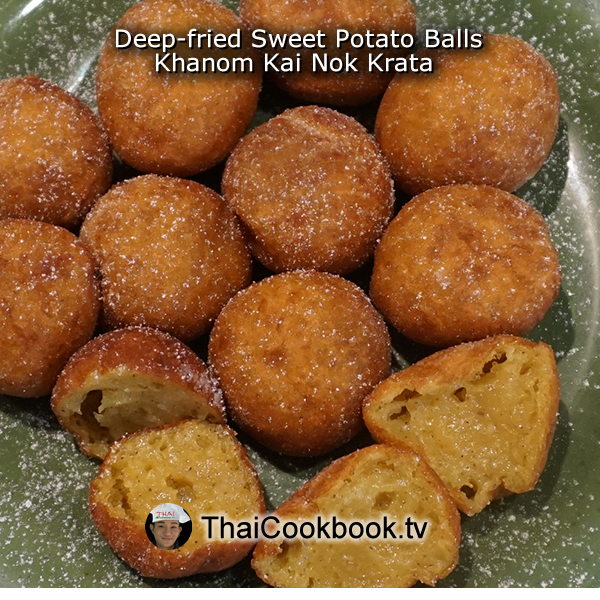 Known here as Khanom Kai Nok Krata (ขนมไข่นกกระทา) because they are small like quail eggs, (khanom is a snack, kai nok krata are quail eggs) they are quite easy to make at home. The outside is crisp and a little like a donut, and the inside is like a soft and chewy candy that tastes like sweet potato. This recipe makes about 50 little balls, so you'll want to have someone around to help eat them, as they are best when eaten still a little warm. 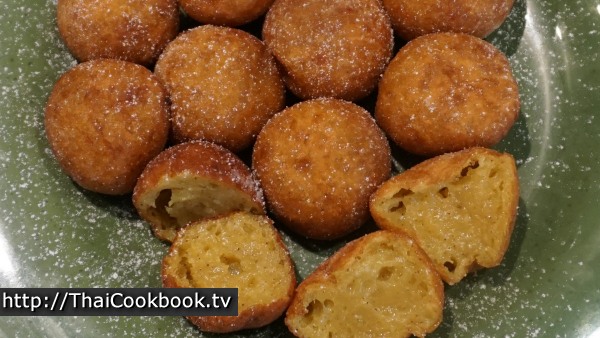 What's in our Sweet Potato Balls. How we make our Sweet Potato Balls. 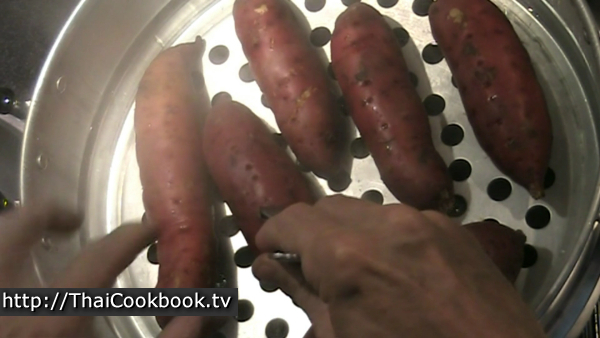 1) Cook the sweet potatoes until soft, then mash or whip to get about 2 cups of mashed potatoes. 2) Combine mashed sweet potato with tapioca starch, sugar, salt, and cinnamon. 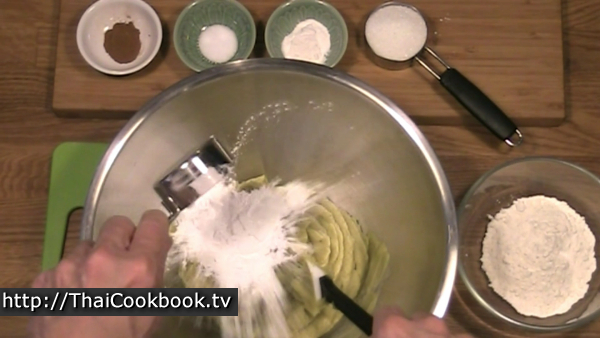 Stir together well until you have a thick batter. 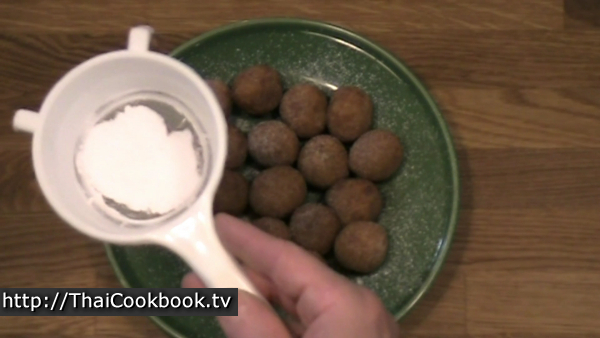 3) Dust your hands with flour and roll 1 teaspoon of the batter into little round balls. 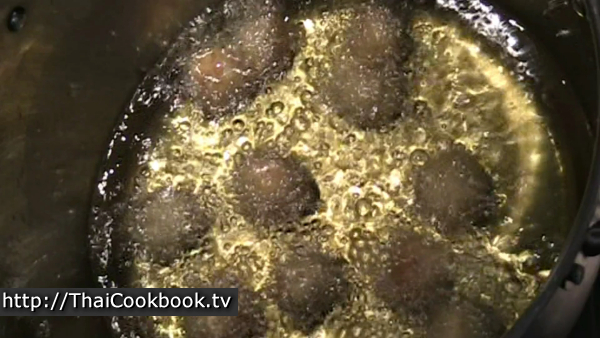 4) Deep fry the balls in vegetable oil for about 5 minutes. Allow to cool down some, then dust with powdered sugar. Serve while warm. 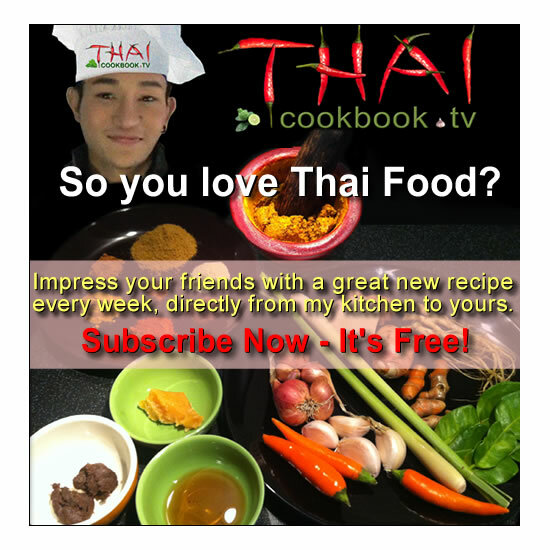 To make the Thai sweet potato balls we need about 2 cups of mashed sweet potato or yam. 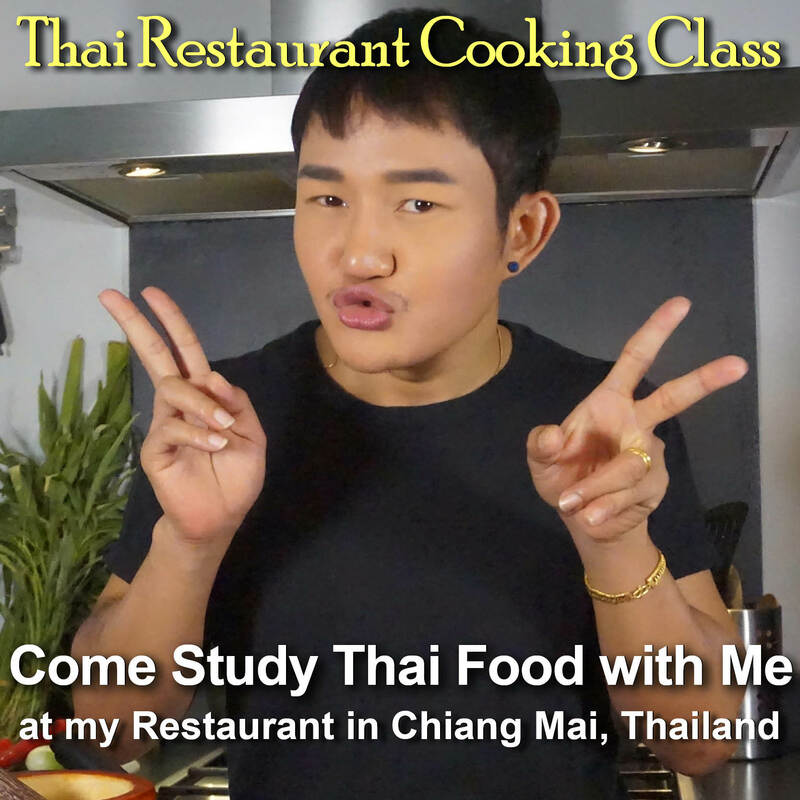 In Thailand we usually steam the potatoes to cook them, but you can boil, bake, or even microwave them. The goal is to get nice smooth mashed or whipped potato. These will take about 20 - 30 minutes by steaming. Check them with a fork to be sure they are very soft. 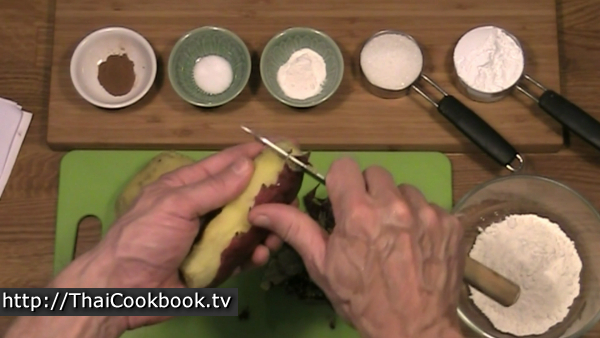 Peel the potatoes and cut away the rough ends and any hard spots. Mash or whip the potatoes thoroughly however you normally do it. 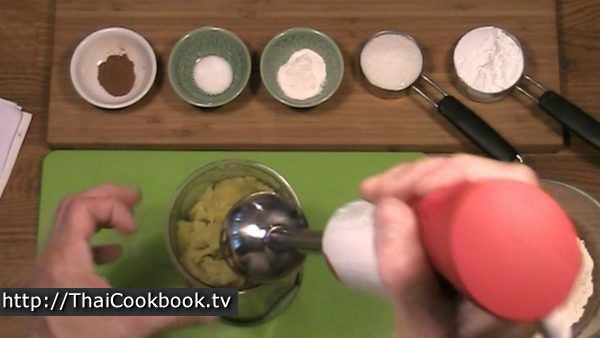 I like to use my hand blender so I can measure the whipped potato at the same time. Now just add in the tapioca starch, sugar, salt, and cinnamon. Stir it in well to make a thick and pasty batter. Dust your hands well with all purpose flour, spoon about 1 teaspoon of the batter onto your hand, then roll it into a small ball. This takes a little practice and experimenting with the right amount of flour, so don't worry if the first one comes out wrong. 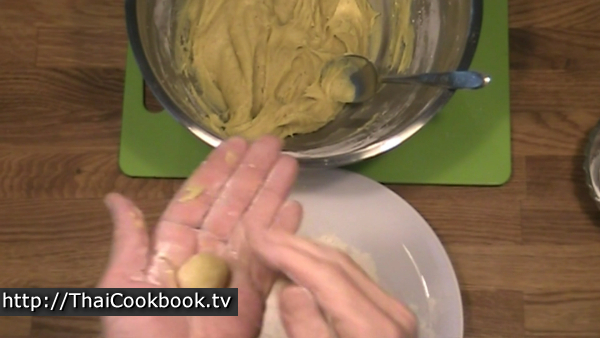 The batter is quite sticky, so keep putting flour on one hand as you continue to roll. Eventually you will have a ball that is not sticky on the outside. 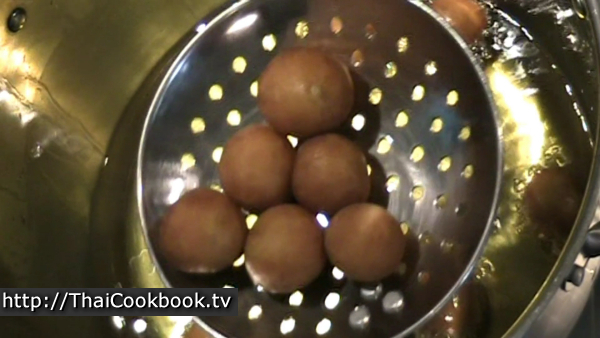 Roll all the balls and lay them on a pan dusted with flour or lined with wax paper. I use a big pot to deep fry in so the oil doesn't splatter. 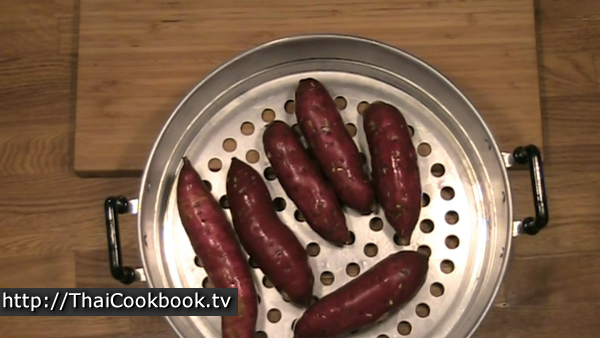 If you have a deep fryer that will be even better. It's important to keep the temperature low, so only at 150° C or about 300° F. This is on the low end of the temperature normally used for frying. 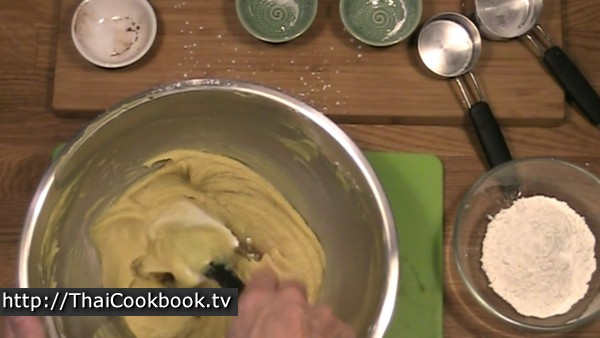 The batter has a lot of sugar so they can easily burn if too high. They need to cook for at least 5 minutes and still be golden brown. Fry just a few at a time so they aren't crowded and stir continuously with a rolling motion so they roll around and never sitting still. Remove them from the oil and let drain on a wire rack or paper towels. Dust a light coating of powdered sugar over them while still very warm, then allow to cool some more. For the best flavor and texture, serve while still a little warm.